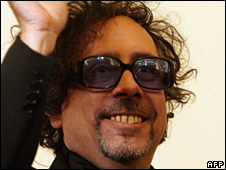 US filmmaker Tim Burton has been asked to head the nine-member jury at this year's Cannes Film Festival. The Edward Scissorhands director said he was looking forward to the role, calling it a "great honour". "When you think of Cannes, you think of world cinema. And, as films have always been like dreams to me, this is a dream come true," he said. The panel will decide the winner of the prestigious Palme d'Or for best film. The 11 day event runs from 12 May. Burton, whose film Ed Wood was shown at Cannes in 1995, said: "After spending my early life watching triple features and 48-hour horror movie marathons, I'm finally ready for this." Burton, 51, has a reputation for visually arresting, off-kilter movies, including Beetlejuice, Planet Of The Apes and the 1989 version of Batman, starring Michael Keaton and Jack Nicholson. Festival president Gilles Jacob called the filmmaker a "magician". He added: "We hope his sweet madness and gothic humour will pervade the Croisette." Burton's next feature, a 3D adaptation of Lewis Carroll's Alice in Wonderland, starring longtime collaborator Johnny Depp and his partner Helena Bonham Carter, is scheduled for a March release in the US.